This mouth-watering, completely ah-mazing cake is a great way to treat yourself! If you look at the Crock Pot Chocolate Lava Cake, you will notice that the measurements are doubled here. I am feeding an army at our "small" group, so I knew that I needed to double it. If you are not feeding an army, you can cut this recipe in half and use a 3-quart crock pot. I used my Casserole Crock Pot for this. I love the 9x13 pan for crock pot cakes and casseroles. It just works perfectly. 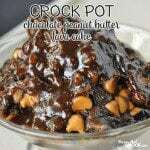 If you don't' have one, I would use a 6-quart slow cooker for this recipe. I used Reese's Peanut Butter Chips in mine. I don't usually use name brand ingredients, but they were on sale and cheap. They worked great! You can try it out with your favorite peanut butter chips if you don't have/want to buy Reese's Peanut Butter Chips.